Visiting The Most Beautiful Garden In The World! Majorelle garden aka Le Jardin Majorelle has been commonly rated as one of the most beautiful gardens in the world and I can see why. Le Jardin Majorelle is by far the most beautiful and enchanting garden I've ever visited to date. Crazy to think we almost didn't go to Majorelle garden during our holiday to Marrakech! Majorelle garden are a haven for nature photographers. Le Jardin Majorelle aka Majorelle garden is a must see in Marrakech. 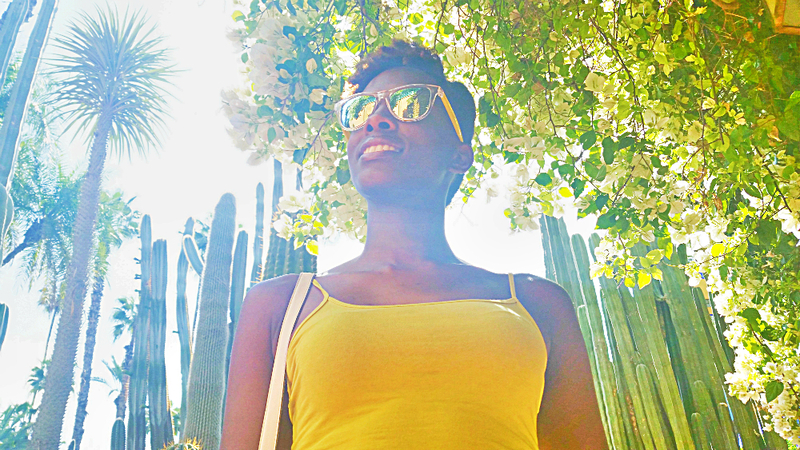 It was a wonderfully hot and sunny day when we took a spontaneous trip to the Majorelle garden, Marrakech. The garden was bought by Yves Saint Laurent in the 80's and pays homage to popular fashion designer Yves Saint Laurent aka YSL. You can expect to spend approximately two hours at Jardin Majorelle. I'd seen colourful pictures of the Majorelle garden before our visit. The prominent theme of blue and yellow works so well and I decided we should all wear matching colours. Doing so made for some stunning pictures. There is an impressive array of cacti at Majorelle garden. Distinct, colourful hot poker plants and sky high palm trees. The beauty of such a vast amount of foliage had me in awe throughout my day at Le Jardin Majorelle. There are ponds at Majorelle garden with giant lily pads and a show stopping giant rhododendron bush. Plant lovers will love Majorelle garden for sure, and you'll be glad to know that it's an inexpensive excursion. Subscribe to this travel and lifestyle blog for future updates. 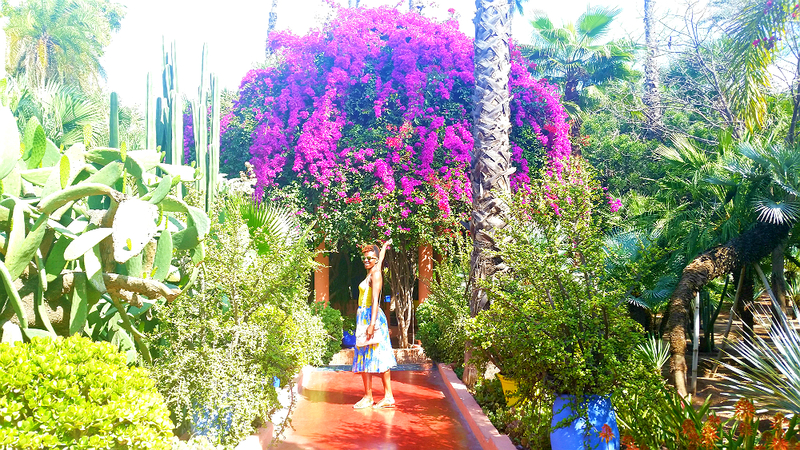 This is a personal travel post documenting an excursion to Majorelle garden. Also known as le jardin majorelle. It is one of the most beautiful gardens in the world. Owned by Yves Saint Laurent. Designer behind popular brand YSL. The majorelle garden is in Marrakesh Morocco. One of the most popular excursions in Marrakech. 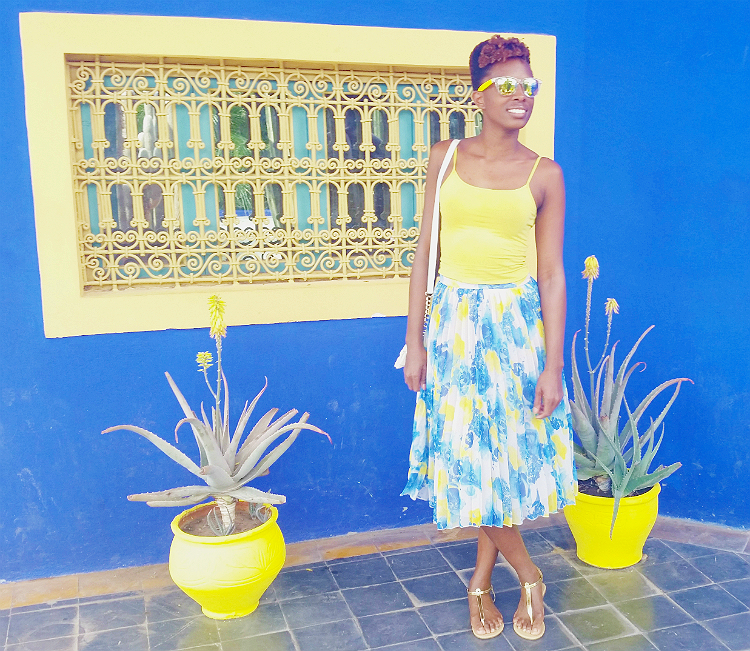 Le Jardin majorelle is famous for it's color theme of yellow and Majorelle blue. The colour and colours of the garden are unique colors. The photos taken at Majorelle garden are originals and are copywritten by the owner of www.gonesunwhere.com The photographs and text on this blog must not be copied. Distributed. Sold or printed without prior written consent of this travel and lifestyle blog owner. Contact the site owner for more details.